FBI Director Chris Wray will be replacing his chief of staff over the next few weeks - one week after he testified before House committees in their ongoing probes into the bureau's conduct while investigating Hillary Clinton's email case, several sources told CNN on Tuesday. James Rybicki - who also served as James Comey's chief of staff, will be replaced by white-collar lawyer, Zachary Harmon, according to the sources. 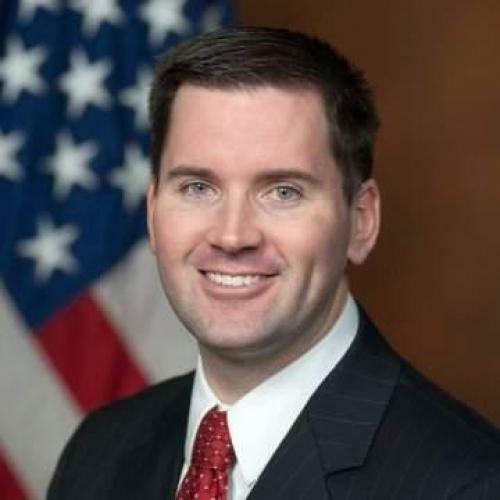 "Jim Rybicki notified me last month that he will be leaving the FBI to accept an opportunity in the corporate sector," said Director Wray, adding "While this is an exciting move for the whole Rybicki family, Jim will be dearly missed by the FBI family -- and by me personally. His many years of dedication to the Bureau and (Justice Department), his level-headed judgment and earnest professionalism, and his steady good cheer have been an asset to us all and have contributed greatly to the safety and security of our nation." Congressional investigators questioned Rybicki over how the FBI handled the Clinton email investigation last week, according to Rep. Jim Jordan (R-OH), however the closed-door questions were likely designed to avoid overlapping with special counsel Robert Mueller's Trump-Russia investigation. Congressional Republicans had sought Rybicki's testimony for months on the hope that he can provide key information supportive of President Trump's decision to fire James Comey, while Democrats have called the GOP investigation an effort to undermine the ongoing Mueller probe. Last fall, Senate Republicans released a partial transcript of an interview with two FBI officials - one of whom Senators Grassley (R-IA) and Graham (R-SC) believe to be Rybicki. During the interview, investigators were told that Comey decided in early May 2016 to draft his exoneration of Hillary Clinton. Rybicki, as it turns out, was involved at some level in the crafting of Hillary Clinton's exoneration - which downgraded Hillary Clinton's mishandling of classified information and use of a private server from the legally consequential phrase "grossly negligent" to "extremely careless" - not a legal term of art. FBI counterintelligence agent Peter Strzok and was removed from the Mueller probe after an internal investigation found a trove of anti-Trump text messages between Strzok and his mistress, Lisa Page while they were both investigating Hillary Clinton's email case. Last year, the Justice Department sought to block Rybicki from appearing before Congress - defying requests from Senate Judiciary heads Chuck Grassley (R-IA) and Dianne Feinstein (D-CA), who were willing to keep the testimony to matters outside the scope of Robert Mueller's ongoing investigation. The DOJ refused, “consistent with the Department’s long-standing policy regarding the confidentiality and sensitivity of information relating to pending matters" - pointing to the "confidentiality and sensitivity of information relating to pending matters," as well as the ongoing Mueller investigation. Rybicki was also involved in the aftermath of the infamous June 27, 2016 "tarmac" meeting in Phoenix between Bill Clinton and former Attorney General Loretta Lynch - which happened six days before James Comey's exoneration statement. After the press was tipped off to the clandestine meetup, the FBI engaged in a furious scramble to figure out who leaked word of their sitdown. And in emails obtained by the ACLJ, we learned that Jim Rybicki was involved in the FBI's damage control efforts. And with that, a swamp creature who would have been central to the FBI's "secret society" assembled to undermine Donald Trump appears to have been sent down the drain into corporate employment.